What's it really like studying a postgraduate degree online? If you’re thinking of doing a postgraduate degree online, you might be wondering what the experience will be like. How do assessments work? Are there opportunities to interact with other students? What study help and academic support is available? At RMIT University, studying online is about making your postgraduate learning experience user-friendly, flexible and rewarding. Each RMIT online course is developed specifically for the digital space by renowned academic and instructional design experts. You’ll learn the latest industry insights and content, delivered 100 per cent online by a world-class university. With live webinars, video and audio, interactive quizzes and online discussion forums, you’ll love learning as part of a thriving global community of ambitious working professionals. Our content is engaging, interesting, never boring and designed for 21st century learning in the digital era." 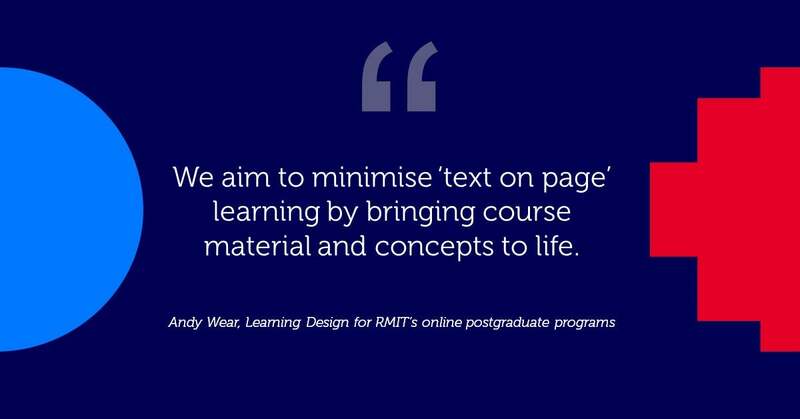 “RMIT’s online customised postgraduate learning environment is clear and simple to navigate,” explains Andy Wear, Head of Learning Design for RMIT’s online postgraduate programs. RMIT’s online course materials are accessible from your desktop, tablet or phone, so you can fit study into your schedule by learning where and when it suits you. Our courses are intensive in nature, which means you will need a high level of commitment and dedication throughout each seven-week teaching period – but it comes with great reward. You may like to watch your RMIT expert webinars live, or catch them later when it suits you. After the webinar, join your peers from around the world in a facilitated discussion forum. “Our discussion forums are a critical piece of the learning puzzle. As soon as you’ve watched a video, embedded under it you’ll see threaded discussions that you can join,” explains Andy. With no formalised on-campus exams, all RMIT online postgraduate programs include rigorous assessments such as case studies, reports and quizzes. As assessment times approach, there’s always plenty of live content available to help cement your knowledge and understanding. Reassuringly, you’re never alone when you study online with RMIT. You can contact your tutor at any time, and you’ll also have your own Student Success Advisor to give you personalised guidance, support and motivation from first contact to graduation day. No matter how small or large your question, your Student Success Advisor is there to support you and see that you get the most out of your postgraduate study,” Andy explains. With RMIT, you can accelerate your learning online to help you achieve your full career potential. Instead of semesters or even trimesters, RMIT offers six, 7-week study periods per year. You can begin your online degree at any one of six entry points throughout the year. We recommend one course per study period, meaning you can do up to six courses per year and qualify sooner." RMIT offers six core business areas of online study: commerce; marketing; engineering; project management; human resource management; and supply chain and logistics management. Online students also enjoy the same access to university resources as an on-campus student, including the library, which features an extensive collection of electronic journals, e-books and training resources. Before enrolment, you can chat with one of RMIT friendly and knowledgeable Student Enrolment Advisors. They will explain course expectations, software requirements and answer any questions or concerns you may have. To discover more about RMIT’s world-class online programs, speak to one of our Student Enrolment Advisors today on 1300 701 171.